Francesco I (1541-1587) is one of the most well-known members of the famous Medici family. Yet, this man, who became the grand duke of Tuscany in 1574, was never very popular with his subjects, the citizens of Florence. In fact, it seems that they actually celebrated the news of his death. However, such a respect was not very important to him, unlike his father, Cosimo I, who died an utimely death caused by the premature ageing of his body, which was a result of gouty arthiritis, a common genetic trait of the family. A king who had already outlived 7 of his 11 children, another of which, the beautiful Isabella, would meet her death not long after, through strangulation by her violent and jealous husband. Therefore, it is possible that such events had a direct effect upon the personality of Francesco de’ Medici , who was a dark, introverted man who never quite managed to become the competent politician that his father was. Although, it is likely that the art of governing never really interested him at all anyway as he often chose to keep affairs of the state at arm’s length preferring to instead pratice the study of witchcraft alongside scientific studies, thus spending much of his time amongst the many cauldrons and burners of the laboratory which he had constructed within his San Marco Gardens. 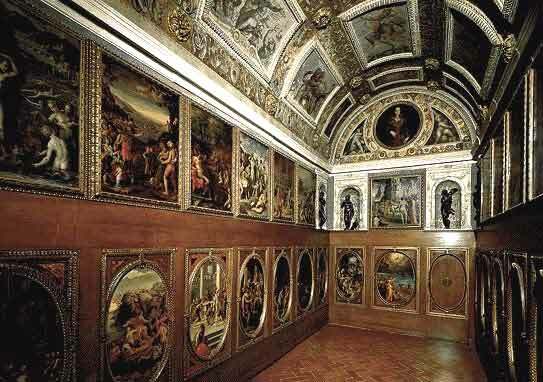 He was also a supporter of artists, one of which, Bernando Buontalenti, he entrusted with the completion of the study of Palazzo Vecchio, a room beautifully decorated with paintings symbolizing acts of obscure withcraft. It was within this room he stored his collection of gold, precious gems, money and machinery and through which he could escape the palace without being seen via a secret stairway. The reserved and quiet Francesco de’ Medici, had another overwhelming passion, which inevitably made him even more unpopular with the Florentine people. A passion which involved a beautiful dame and Venetian adventuress called Bianca Cappello . This woman was already in love with a modest man, named Salviati, who came to Venice as a representative of the pawnshop of the Florentines, and had left the flooding city to escape his family who strongly opposed of his marriage to Bianca. The two took refuge in Florence where Bianca gave birth to a daugther named Pellegrina. Nobody knows exactly how or when, but Francesco fell madly in love with her and they formed a relationship which sparked an outrage throughout the entire city. This was mainly due to the fact that the Medici king had just recently become engaged to marry Giovanna d’Austria, the sister of Emperor Massimiliano II of Asburgo, a woman who was not of great beauty and who possessed a pompous and arrogant personality. Yet, despite the controversy and disapproval of the Florentine kingdom of this torrid relationship, especially since this woman was not from an upper-class background, Giovanna tolerated her husband’s affair with great dignity and composure, a husband with whom she had had a son called Filippo who died at a young age. If anyone reaped the benefits of the affair between Francesco and the Blonde Bianca, it was Bianca’s husband, who gained much money, benefits and a magnificent palace, and so he was nicknamed Cornidoro by the Florentines. However, by this time being addicted to the thrill and having many other addictions, he must have, at some point, gone overboard with his demands. So much so that, one night, near to the Santa Trinita Bridge he was stabbed to death by several hitmen, whilst his lover, Cassandra de’ Ricci, who had consoled him over the many disasters of his marital life, was assassinated in her bed by several masked men. It is true that if Bianca had given Francesco the son which Giovanna was unable to provide him with, it would have been much easier for her to reach a much better position in the life of the Grand Duke and win the heart of her royal lover. However, she managed to do this, instead, by buying him, in order to save the newborn baby that she had just given birth to. The mother was made to believe that her newborn son had died straight after birth and so her milk could be used to feed another newborn from the Medici household. Incredibly, for a certain period of time this trick worked, to the guilt of the Medici doctor. Franceso himself felt like a proud father and he named the baby Antonio, in honour of the Saint which was responsible for assigning grace. However, eventually the truth surfaced, thanks to a waiter who, being an accomplice, revealed to a nurse that the baby that was being breastfed was in fact the son who was believed to be dead. It seems that, afterwards, the same doctor, at the end of his life due to a serious illness, confessed all his guilt. Nevertheless, Francesco, did not change the infant’s name and he remained very fond of him. In 1578, following a deadly fall in the Santissima Annunziata church Giovanna d’Austria died. She was only 31 years old and was already in her 7th pregnancy. It seems that her last words were surprisngly words of affection about her husband. After only 3 months, Francesco married Bianca in secret and she became the Grand Duchess of Tuscany. This intensified further the Medici family’s and the Florentine citizens’ hate for the Venetian Blonde who was perceived as being a woman of loose morals who conducted herself without any discretion or integrity. However, despite all the suspicion surrounding their relationship, there was a genuine affection between the two of them. Francesco had by now become tired of the Florentine court, constructed by Buontalenti, in the vicinity of Pratolino. It consisted of a palatial mansion that had become famous, along with its beautiful garden, as a place of wonders. It is here, and in the other house of Poggio in Caino, that the King retreated along with Bianca, who had still not managed to provide Francesco with the son he so desired and whose beauty, at only 40 years of age, had definately disappeared due to deformities which were a side-effect of her hydropsy medication. By now, Francesco was also showing signs of physical deformities which were brought on by his extensive withcraft research and by his strange diet. On October 8th 1582, Francesco returned to his Poggio Mansion in Caiano after having spent the day hunting, with a dreadful fever. He wanted, as always, to be cured by one of his own methods, however this was not effective. He died soon after following several days of agony. In the meantime, Bianca had also started to show the same symptoms. After Francesco had passed away, nobody dared to break the news to his spouse that she might also die of the same condition. However, she already knew and whispered I believe that I may die along with my husband. This is what in fact happened only 11 days later. Her critics suggest that Bianca had prepared a poisoned cake for her brother-in-law, the great Ferdinando but it had been eaten by Francesco by mistake and then also by a panic-stricken Bianca. In any case, it was the end of the love story that had created such scandal, scandal which had to be continually covered up by the great Medici family. The members of the Medici family, who had never hidden their dislike of Bianca did not lose any time in getting rid of every trace of her. Whilst Francesco’s funeral was much more spectacular and serious than anyone could have ever imagined, the corpse of poor Bianca was instead laid to rest at night in a common trench of which there was no trace. The glorious Pratolino Palace, the love nest of the 2 lovers, was abandoned, and so the building, that had amazed many of its visitors, had to be destroyed. However, to this day its splendid and mysterious park, its huge Appennino Statue and the work of the Giambologna, the only silent witness to the events which went on between the two lovers, have all survived. All portraits of Bianca were destroyed just like the rest of her belongings, the coat of arms having been erased from everything. Nothing, not even a single memory, has survived of the beautiful Venetian who had won the heart of Francesco de’ Medici. Only very few images having escaped such destructive rage. Yet such tenacity did not fulil its purpose. The figure of Biance Cappello, regardless of this hate from the Florentine court, remained one of the most famous of the Medici Family and the incident of the two unfortunate lovers are now looked upon with compassion and tenderness.